May 1st is National Scrapbooking Day- SALE at FCD for 7 days! 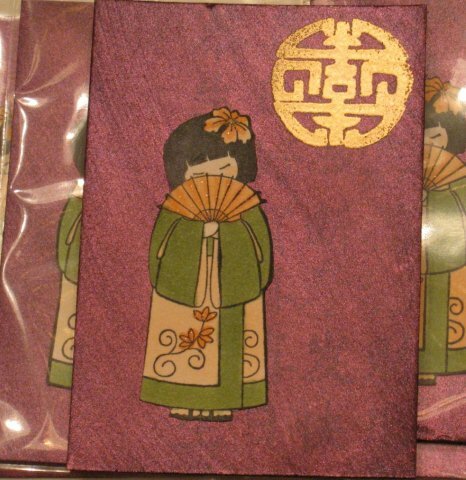 Pamela at FCD is celebrating National Scrapbooking Day by having a SALE! Tomorrow is National Scrapbook Day! To celebrate, FCD has put together these 2 sets, especially chosen for use with scrapbook pages! What a perfect way to create page upon page of memories for future generations to keep close to their hearts. Pamela also carries Flower soft, Shimmerz and Twinking H2O's, and Red, Clear and Digital stamps! Are you new to unmounted stamps- they are such a space saver! When you order them, you recieve a red rubber sheet of stamps. I use KAI scissors to trim them, then I apply Tack it over and over again- Pamela carries this- I learned of this product from Michelle Zindorf- thanks Michelle! I just paint it on the back of my stamps. Next, I store the stamps in a clear CD case- Pamela includes photo's of the stamp set when you purchase a set- I just slide this into the front of the CD case for easy access to viewing my images. (You can zerox the sheet for your index as well). 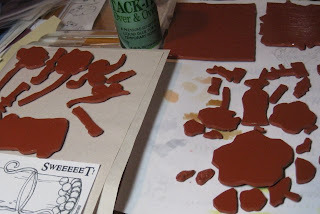 The Tack it over and over again makes the stamps sticky on the back, so they adhere to the clear acrylic blocks for stamping. Just use the stamps with a cushion of some type (a Darice Craft Mat, a magazine...whatever is easy) and stamp away! 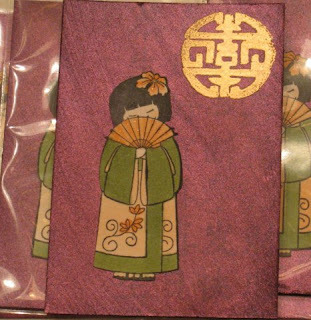 Clean by dabbing the stamp into your stamp cleaning pad and put the stamp back away in it's case. The above set is only $8.99- thats alot of **coordinating** rubber for the $$$ in my opinion. Stop by Firecracker Designs by Pamela- tell her Shelly Sent you!!! Our Bloggers Challenge this week is embossing. There are alot of ways to emboss, I went with Versamark and embossing powder. 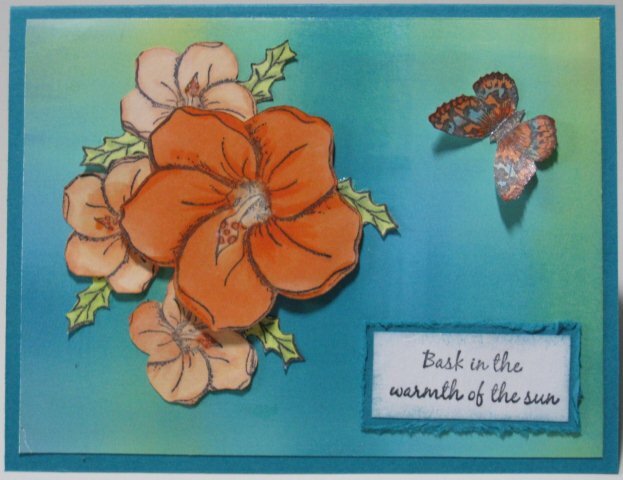 I could not resist making another card with a summer theme…..come on Summer! I colored the umbrella’s with Copic markers and painted over the Copics with Creative Inspirations Paint. While I was at it, I decided to make a second card with the same stamps (Happy Hour) by Firecracker Designs by Pamela. I used a Sketch Challenge by Operation Write Home Stars and Stripes blog from last week- a project to make cards for the troops. My Blog sister Karen is very active in this group and has inspired me to try a challenge. I have been sending boxes to soldiers for about 5 years- I try to include cards for the kids to send home- the current soldier is the son of another nurse that works in my department. How fun is this? Put the lime in the coconut and drink it all up, Put the lime in the coconut call the Doctor woke him up said, DOCTOR……am I aging my self??? I loved that song way back when…. I used the one inch circle punch and Coordinations CS, cut the top of the circle off, added a little piece of white CS to mimic milk in the coconut- and lightly sanded the CS. I then finished the card using the sketch and alot of TJ Techniques, including Depth of Field, Sanded Coordinations and Whisped Frames. Copics used for coloring- no glitter can be used for cards for soldiers overseas. The guys and gals love hearing from home! A family that used to be our neighbors has had a serious incident- and we need to send a card. I tried my best at a CAS card today. I used Kraft CS and stamped a simple floral image in Choc Chip. Close to Cocoa and then White Pigment ink. I added a backing of brown CS and a white scalloped edge on the bottom. I hope the card will being them comfort knowing others are sending well wishes and praying for them. TODAY is the last day to enter the Stamps R Us challenge for April-the theme April SHowers- click on the link in my sidebar if you are interested in a chance to win some great candy! Each month, the Technique Junkies has a swap called the Just one. It is a 1-4-1 swap where I am assigned a partner, and we swap cards using a TJ Technique. It is another great way of seeing, touching or trying something new. 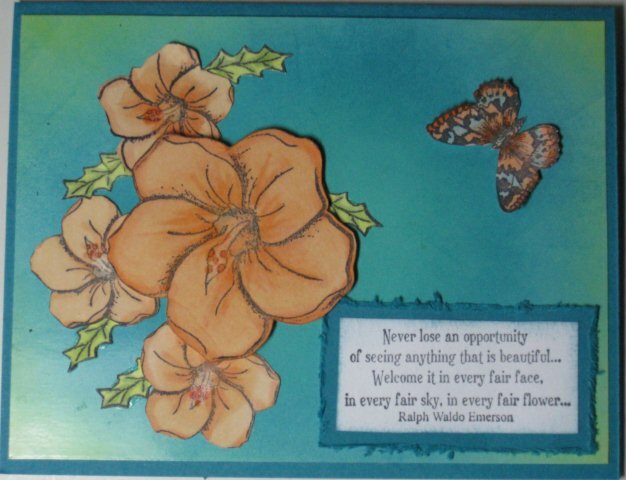 I used more of the Spray Starch background that I recently made to create this card. I made this on Sunday- inspired by the Featured Stamper Gloria on Splitcoaststampers! Here is the link to the Featured stamper on SCS for this week…… I wanted to wait until my Just One partner received her card before I posted this one………. Nestability circle, dragonfly brad by Markies Finest papers. I colored the flower with Copic Markers. My partner is Hewitt Hulse. She used the Chalk Lines Technique- which I have never tried (yet), and used Chalk Pencils. How can you not love the House Mouse image….! If you want more info regarding the Technique Junkies HERE is the link. You can get the newsletter on-line only- just one option….. Tell Her I sent you! Maybe we can be Just One partners next!!! 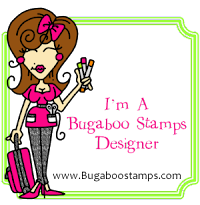 If you want to try out digital images to see if you like them (and want to try images that look like real rubber stamps), check out Pamela’s Blog- she offers a free digital image each week- tell her I sent you! Have you ever made an ATC??? If you have not, they are Artist Trading Cards. They are 2 1/2 by 3 1/2 -the size of a baseball card. 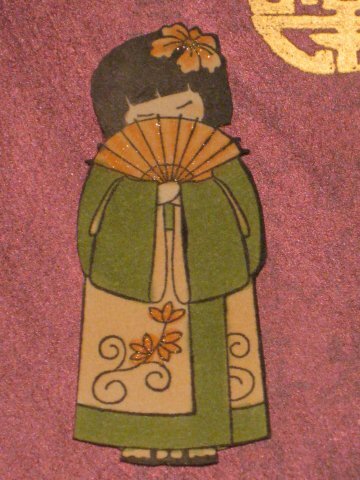 You can make 10 from a standard sheet of 81/2 x 11 cardstock. You can find ATC templates on the internet in a variety of places- a cutting template that describes HOW to cut 10 ATC's from one piece of cardstock. Here is a link to one if you are interested. This background is called Spray Starch and Pearl Ex (PE) by the Technique Junkies. I used Blue Russet PE. Stamps are by Great Impressions and See D's. I used the SU color wheel to match up colors- the PE most closely matches Bravo Burg, and it said to use Almost Artichoke and Green's....I used Copic markers on the Asian girl by Great Impressions plus the Copic Spica pen in peach-oh la la! Love my Spica pens! This qualifies for the ABC Challenge-Sparkle! Fab and Funky-Get it all out...been a while since I used that Pearl Ex! D2D digi plus I won 2 more blog candies…….. I used the Sketch challenge from Mercy’s blog…..I am motivated by challenges today. Designed2Delight (D2D) has changed their freebie giveaway to Friday’s ….if you post a card you get next week’s digi free! And so on, and so on…..I enjoy this challenge alot, so try to keep up with it. I used Copic Markers E53, C5, W1, W3, W5, W7, R20 on Gina K 120# CS, I used Soft Suede and Butterfield by Memory Box that I won from Becca’s giveaway recently. I added sewing around the edges of the card, added ribbons and dew drops. He looks a tiny bit sad……maybe I will use it for one of the many belated Birthdays for my blogging sisters that I have missed lately!!! I wanted to acknowledge two more blog candies that I have won…… I stopped by ChrissyD’s Blog Celebration, and was fortunate to win her 2nd place prize- awesome kit- I will collect family recipes and make this up! Thanks Chrissy!!! And, I stopped by Cassie’s blog to say Hi and entered her Blog candy- won that! Wow- Thanks so much Cassie! I am so blessed- Thanks for all that stop by, and Hugs to you! For my card today, we are to use the colors Blue, Orange and Moss....my Moss took a bright twist to go with a tropical theme for my card. I also squeezed in a color challenge for Verve's Beach Party and the Free 4 All challenge at SCS which is a Vacation theme. I used my brayer and Taken with Teal and Green Galore Inks and made a Sunburst Card (Technique Junkies oldie but Goodie!)....... on the top card, I developed a streak, so ran the brayer up and down and so it is not a Sunburst BG after all.....but I still liked the color..... I colored the flowers with Copic Markers ( "0", YR000, Yr00, YR02, YR07, W3, B02, YG00, YG63). On the butterfly, I colored with Copics, then painted over the color with Angel Wings Shimmerz. I used a distressing tool for the BG of the sentiment, and sponged Taken with Teal on the edge. Challenges-Bloggers Challenge-click the link to see the other players cards! Pearl Ex ATC + I won a digi set! I was recently invited to be in an ATC swap using Pearl Ex …..I have not used my Pearl Ex for ages, and I recently received a gorgeous ATC from my friend Diane using the technique on an ATC , so I could not resist giving it a try. This is a Technique Junkies technique for the Ultimate subscriber (which means I have all of the old newsletters and all of the CD’S……….)….. Thanks again Lindsay! 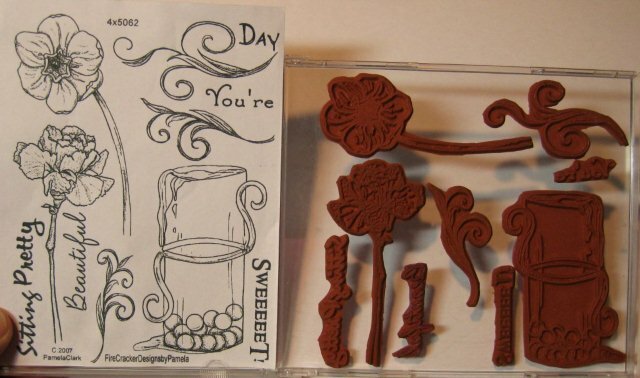 I look forward to the weekend so I can make something with my new stamps! I was so blown away tonight when I came home from work and got the mail. I guess it is part of the fun to have a Sunday birthday- you get cards on Saturday, then again on Monday. THANK YOU again for your Birthday wishes! I am in Heaven!!! Here are some more cards- in no particular order. 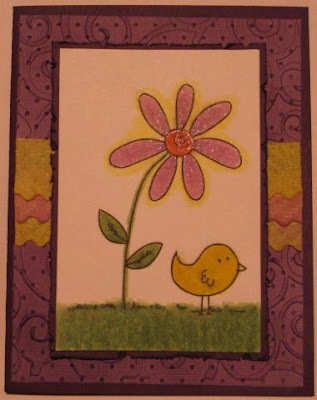 Here is a gorgeous card from my SBS29 sis Joanne-with the flowers fluffed and decorated envelope. Gorgeous card and I LOVE pink! Thanks! * PS Joanne wins more stuff than I do!!! Laura from my Stamps R Us blog group sent me this gorgeous-inside and outside-card! There is sewing on the inside and outside- yes Laura- it is a very Joyful card!!! I love it! Patty aka Lalatty from SCS and my blogging group Stamps R Us sent me this fabulous card- it is done again in my favorite Blue and Pink combo! Thanks Patty-I love the images you sent too! Melisa from my FCD Design Team sent me this darling card- I love the DSP and the fun Robot! You are so sweet girlie! Thanks so much! Carrie from my blogging groups Stamps R Us and the Glitterbee’s sent me this darling Fluffles card and I love the glitter, the butterfly and the DSP. Thanks Carrie! Laverne is a Technique Junkies and she has been dabbling with digi’s. She sends so many BRAK’s on the TJ group- I have no idea how you keep up- they are all beautiful- I love this card-pretty sure it is a glimmer mist BG too! Thanks Laverne! Vicki is from my Sweet Dreamers and Glitterbee’s Blog groups- she is wonderful and sends my frequent blessings. I love this card layout and the way you added to color to the sentiment panel. Thank You! Carla sent me this darling card! Oh heavens- I love paper piecing- and have not tried this yet. Carla is in my Glitterbee’s and Sweet Dreamers Blog group. Thanks for the card, and for the images! You are so sweet! All I have to say is I am so blessed to have so many wonderful blogging friends. I really MUST build up my Birthday Card stash and get it together and send cards on Birthdays- I am terrible at that, but this is really delightful to open all of the envelopes and look at all of these wonderful cards! I feel like a little kid!!! Thanks again for making my day special! On the Anniversary of my 29th birthday (which I have been celebrating for a few years now…..), I wanted to say thanks to so many friends that have wished me Happy Birthday wishes. And I wanted to share the beautiful cards I received in the mail. From Nancy- my Stamping Buddy-Thanks Nancy- I love this card! From Kathy- my Sweet Dreamers, Glitterbee’s and SBS29 blog group friend-such a pretty Verve set- I love this card Plus love the ribbon and glitter you used! Karen from Stamps R Us- I love this colorful Three Pots card- I love that you added faux stitching because you know I love to add stitching to my cards! Love this! From Lynn-another Stamps R Us friend who always makes the nicest cards- and this card is in my favorite colors- Pink and Blue! Love this! From Betsy (Hawkins) a BRAk using a Technique Junkies technique called Glitter Straw-and it is even prettier IRL! I am very blessed to have such wonderful friends. I love this image- Thanks again! It’s that time again-for a BLOG HOP with the crew from Firecracker Designs by Pamela. The HOP officially starts at 8AM 4/16 and runs through Monday 4/19. This month we are challenged to do word play-I chose A-P-R-I-L as my word to describe my card-my Birthday month! A-Already cut out-yes, I did not do all of that cutting! These shapes come in THIS SET already cut out (minus the star and the umbrella)! P-Paradise-from “Happy Hour” the Stamp Set I used- yep-still LOVE my rubber! L-Little microbeads on the tops of the Margarita glasses………mmmmmmmmm (The straw on the glass on the right is the stem of the flower in the set). Our Blog Hop is a circular hop- so when you arrive back to my blog, you are done. If you post a comment at each blog along the way, you will be entered to WIN- the prize hostess is a secret-even to us- only Pamela knows….! We have a Sketch challenge from Creative Inspiration Paints Blog and I took the opportunity to use some new stamps (I bought them a month ago!) from Heartfelt Creations. Once cut out, I layered a 'center' into the flower, and ‘fluffed’ it up so it would be dimensional. I added Tallings in the center of each flower (Barbara Trombley elements). I used a small Cuttlebug folder-which I had to cut open in order for it to be in the right direction……. I used white core Dk brown CS- and when sanded the white core shows. I painted the white areas with Creative Inspiration Paints- Citrus and Green Olive for the leaves, Tutu Pink and Blush for the flowers. I used Fairy Dust CI Paint on the flowers- can you see the shimmer??? The edge is a Martha Stewart Punch. The sentiment is Sweet n Sassy from the Easter Lilly Set. Creative Belli-die cut shapes- The Flowers! Want to win some CI paints??? Check this post HERE to see how you can WIN 4 jars of CI paints and 10 yards of SU double sided Satin 5/8” ribbon! Come Join the Stamps R Us Bloggers. We participate in a monthly challenge- this month it is my turn to post the challenge. Our theme this month is April Showers- we can use any images or items related to showers for our cards. Use an umbrella, and image with raindrops or favors for any type of shower. Please only post new cards or favors. One lucky participant will be randomly chosen to win one yard of each of the 10 SU double sided satin ribbons and 4 jars of the new Creative Inspirations Paints. Wahoo! Come play along- you have until April 30th to enter. 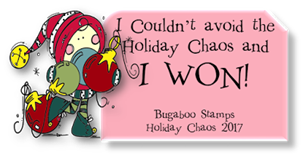 Post your entry Here on the Stamps are us Blog and check back on May 1st to see if you are a winner! Image is House Mouse, Sentiment Clear Dollar Stamps. Image was water colored and Spica pen added for glitz- which is hard to see in my picture. SU cardstock, DSP SU and Basic Grey. I made a quick card for the D2D (Designed2Delight) weekly post- a weekly freebie is issued IF you post a card with the freebie from last week. (You can also purchase the image to get started, then post a card with it and get the next one free). I colored the image with Copic markers, added a touch of clear Spica for some glitz- this card is not true to color- I cannot get it to look right- so just posted the best shot of it. The background is a Technique Junkies technique called double buggin’ and the 3 strips behind the card are scraps of Faux Velvet-also a TJ technique- left over from a prior card. The Faux Velvet is very shimmery IRL- it is done with Creative Inspiration Paints in a mini-mister mixed with Water- and gives a wonderful shimmer on anything you spray it on! The Bloggers Challenge this week is to ‘Alter It’. I decided to make a sewing kit for my daughter. Have you ever been somewhere and had a button pop off or a strap of a dress ‘pop’…..yikes… I have- so I always carry a needle and thread of some type… ( My children are all required to know how to sew on a button prior to leaving for college). I traced around the lid of the tin and made a template for the Basic Grey DSP. Then I stamped and colored in the House Mouse image and colored it with Copic Markers and Creative Inspirations (CI) Paint on the spool of thread. I painted a Prima flower with CI paint, and then decided to add a little ric rac painted with CI paint as well. The purple strip in the background is called faux velvet, and it is done with CI paint and is a Technique Junkies technique. I added purple ribbon around the ‘rim’ of the tin to finish it off. Add a piece of adhesive backed magnetic strip, and needles and pins will stay in place in your sewing kit-on the lid- you can make it as short or long as you please. If you are traveling, put a fingernail clipper in the kit to cut your thread if needed, and airport security will not take your scissors away………. To view other projects click here- Bloggers Challenge –to see more ‘Altered Items’. Pamela at Firecracker Designs has a preorder sale going on for two new Wedding Sets. From time to time, I will offer new plates at a pre-order special price. This means I have not yet ordered the rubber for them, so I will offer a lower price if you pay for your stamps before I order them. These sales are usually pretty short, only 2 or 3 days, so be sure to place your pre-order before the price goes back to it's regular amount. Orders will ship on a first ordered basis, as soon as I get them in. (usually about 2 weeks after the sale ends) Thanks! All of these sets are red rubber, unmounted, and untrimmed. Click the thumbnail for larger pix, and set details!! This pre-sale will only be up til April 11th!! 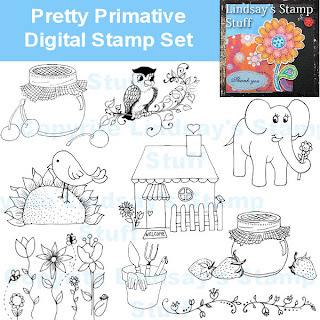 Here are the sets- $6.99 for ALL of these stamps (each set). Here is the link to the website for Firecracker Designs by Pamela . 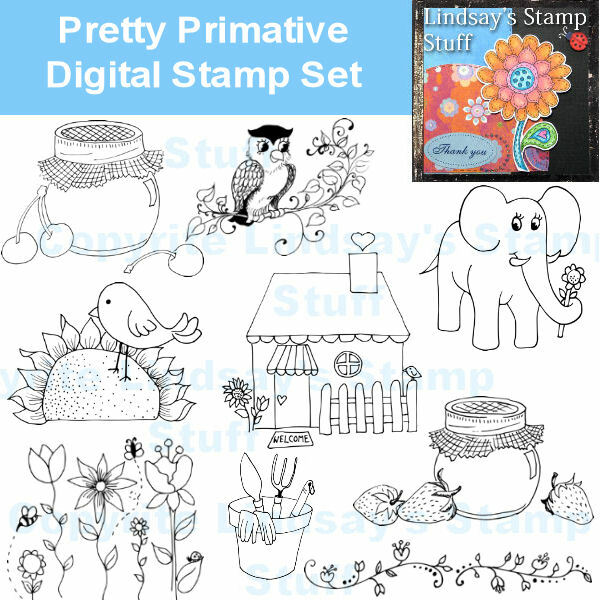 Did you know Pamela offers FREE Digital stamps each week? After a week, there is a new one posted and the previous stamp goes into the store for sale- we’d love to see what you create!!! (The link is for the current freebie). My daughter loves being in a sorority, and it is time to initiate ‘Lil’s’ into the sorority- they have a winter Rush and the new recruits join them in the Spring. She asked me to make something for the new recruits in her ‘family- she and her ‘lil’ have twins joining their ‘family’ –as there were more new recruits than there were Sophomore students- they have two- so they call them twins (my daughter is a twin, so she is enjoying having some fun with the idea). My daughter asked me to make the ‘twins’ mailboxes. So I got to work and made some mailboxes with her school theme. Ohio State ‘Buckeyes’ and the Sorority Mascot is the Owl (hence Hooters). College is just flying by for us- my twins are just shy of finishing their third year(s) at college-seems like just yesterday……….. 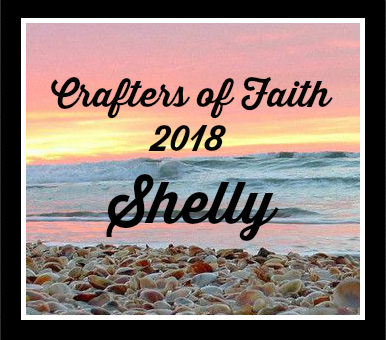 Thanks for stopping by to share in my crafting creations! Faith over at D2D gave us a lighthouse to use this week as our free digital image. I used a combination of techniques to color the image- the water, shore, lighthouse and the yellow light are Copic markers, the clouds and sky are water colored. I added Creative Inspiration Paint over the white wash of the waves and the yellow light from the lighthouse. For the water, I scribbled multiple blue Copics over the bottom of the page and blended the colors together. The sandy dune hill is brown Copics and I took a little colorless blender and dabbed it on a washcloth, and dabbed the dune. That gives the dune texture. I left the card blank so I could add a sentiment later. The Bloggers Challenge this week is Easter. I made a card for my daughter who is at college. I found this cute digital image by All That Scraps. I colored it with Copic markers and a Spica pen. I used E0000, E000, E02, B000, B00, B02, Y11. Y13, E15, and R20. I used two Technique Junkies techniques Color Outside the lines and Sanded Coordinations. The outside color of Blue coordinates with the cardstock- looks better IRL. I used Mercy’s sketch challenge-which I flipped on it’s side.